Summer Streets is upon us again. On the first 3 Saturdays of August walk down Park Avenue and Lafayette Street from 72 Street all the way down to the Brooklyn Bridge this time with addition of the opening of the Park Avenue tunnel which will feature a light and audio installation. 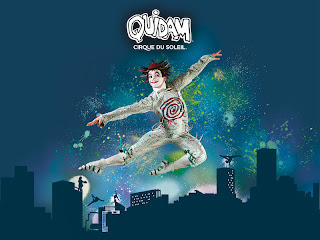 Cirque du Soleil - "Quidam"
In a tentless production, Cirque returns to NY with the long-running Quidam for a short stint at the Barclay's Center in Brooklyn. Quidam, which means "anonymous passerby" originally opened in 1996, converting to its current format for arena staging in 2010 (thanks, Wikipedia!). When I first discovered Cirque years ago, I was a huge fan, anxiously waiting to find out when the next tour would be performing nearby. After the third or fourth production, however, my enthusiasm waned. Perhaps the novelty had worn off compared to the ticket price.